$30.00 In stock. Order in the next 7 hours, 47 minutes and it will go out today! In stock. Order in the next 7 hours, 47 minutes and it will go out today! Do you like super easy to perform card magic that requires almost NO sleight of hand but still packs a MIGHTY punch? 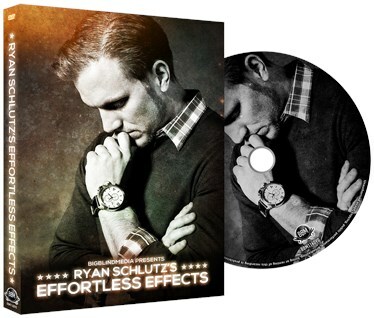 If so, RYAN SCHULTZ'S EFFORTLESS EFFECTS IS FOR YOU! As you would expect from Big Blind Media, the quality on this project, both in material and production, is fantastic. Effortless Effects features seven full routines, all of which utilizes techniques that will absolutely decimate even knowledgeable magicians. So just IMAGINE how fooled normal spectators will be! There is no back tracking these effects, the methods are just too devious. Incredibly easy to perform, each routine is a masterclass in how structure, psychology and ingenious thinking can create earth shattering magic. Magicians of any skill level will be able to perform the trick on Effortless Effects, and the results will be the same for all - a shellshocked audience. And with no sleights to worry about this is 100% about having fun in presenting the tricks. Ryan also delves into his ultra sneaky "GAP Principle" - a super simple to implement strategy that gives you outrageous control over the cards. Learn it in minutes - utilize it in your magic forever!